In the prestigious city of Lee’s Summit, Missouri there are many remarkable subdivisions and neighborhoods boasting truly impressive real estate options. As a suburb of Kansas City, Lee’s Summit continues to be a popular destination among buyers looking to relocate in the Kansas City Metro area. 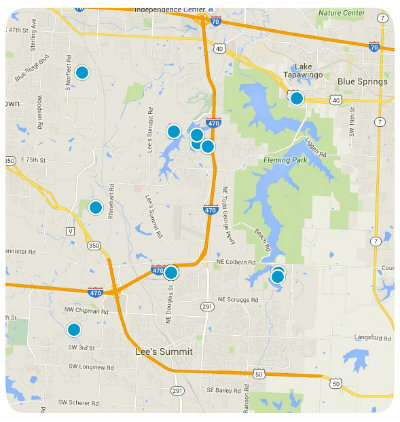 Despite its consistent popularity, Lee’s Summit continues to have both beautiful and affordable homes. If you are looking to relocate in the Lee’s Summit area, you should consider the upscale options of The Paddock at Richardson Ranch. The Paddock at Richardson Ranch is an elegant neighborhood with beautiful homes, ideal for families. Community amenities include a neighborhood pool and a website that helps residents make connections with their neighbors. The Paddock also has multiple community events each year to keep residents engaged and entertained. One of the most popular events is the annual 4th of July parade. This remarkable community is located on land that was once a 200 acre horse and cattle farm owned by Mr. and Mrs. Richardson. In 1999 the land was developed into around 300 luxury homes. The Paddock is unique because it boasts some of the largest lots in the area, with some as large as half an acre. This gorgeous community has an abundance of mature trees and green spaces. Lots available for building in The Paddock at Richardson Ranch vary in price but typically range from $45,000 to $90,000. In addition to great lots, beautiful homes, and friendly neighbors, The Paddock also boasts close proximity to the elementary school that serves the community, as well as scenic walking trails, picturesque parks, a golf course and the Legacy Community Center. If you would like to buy a lot to build a home in The Paddock at Richardson Ranch, or you are interested in buying a home in The Paddock, please do not hesitate to contact us today. We would love to serve you. Listing courtesy of Debbie Weber of Bill McCoy Real Estate Co. LLC. Listing courtesy of Sarah Jaeger of Chartwell Realty LLC. Listing courtesy of Melanie Franke of Keller Williams Platinum Prtnr. Listing courtesy of Shelley Lee of ReeceNichols Lees Summit.